You'll make the Sugar Plum Fairy so proud. If the typical evergreen wreath with a red velvet bow is a little too overdone for your taste, it may be time to try going for something a little sweeter this Christmas. 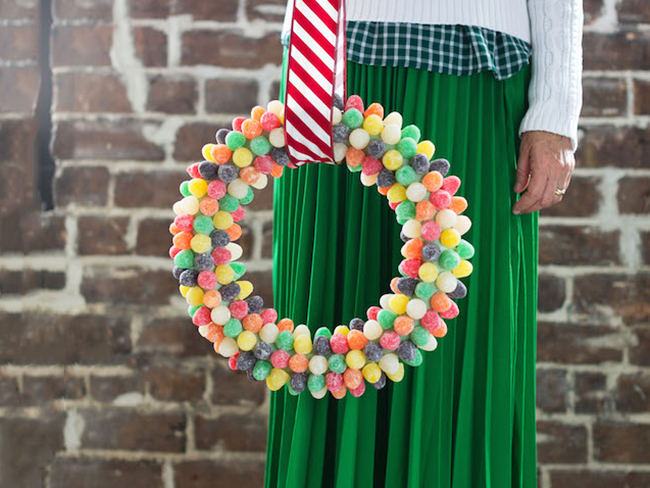 To fully embrace the whole sugar sweet gumdrops aspect of the holiday, try one of these delightful candy wreaths. If you want to be super Christmas-y about it, check out this red and white peppermint wreath sure to make Santa take a second glance. For another red and white option, check out this gummy ring wreath, which is pretty much just a big ring covered in lots of smaller rings, plus a pretty bow. Mini Twix bars, Milky Ways, and 3 Musketeers are just some of the candies that make up this wonderfully chocolaty wreath topped with a big, festive red bow. This shiny Hershey's Kisses wreath definitely captures the holiday spirit with its shiny red, green, and silver wrappers. If you're looking for a more British chocolate wreath, enjoy this wreath covered in mini Mars Bars and red and gold tinsel to match the Mars logo. Don't want to pick sides? Go transatlantic with this wreath that includes both Snickers and Cadbury chocolates. In fact, speaking of remaining neutral, there's a Lindt chocolate bear at the bottom, and that's Switzerland. This clever wreath uses the pastel hues of Smarties candies to give it its colorful pop, while using the wrappers of those Smarties to make a cute, cellophane bow. For a wreath that says, "What? I just really like Tootsie Rolls," you can buy this Tootsie Roll wreath on Etsy. Or, for another sticky candy that probably got stuck in your braces when you were thirteen, try this wreath of Goetze's caramel creams. If you can't have a wreath that's actually covered with a bunch of tiny, wintry snow-covered hills, a gumdrop-covered wreath will have to do. Plus, gumdrops are more colorful than snow-covered hills.